Price is for a set of 3 Mini Clouds! INTRODUCING THE GINGKO AUDIO MINI-CLOUDS VIBRATION CONTROL SYSTEM Effective vibration control at an affordable price! We are very excited to announce the new Mini-Clouds, an entry-level vibration control system from Gingko Audio. 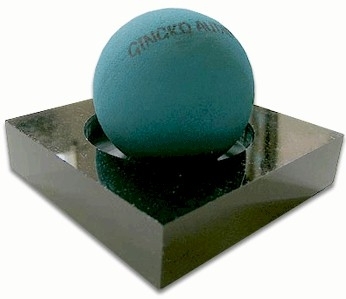 The Mini-Clouds come in a set of three black acrylic bases and three Gingko Audio vibration control balls. "I'll take an educated guess: If you pin a 100% on your current sound without resonance control, the Mini Clouds will readily give you a 20% improvement and perhaps even more, especially if you play things loudly and have full-range speakers. For the money asked, this becomes a slap-me-silly idea whose time is now." Srajan Ebaen, 6moons Even if you only have an entry-level high-end audio system worth $5000-$6000, say a Music Hall or Antique Sound Labs integrated amp, a Creek CD or Arcam CD player, a pair of Reference 3A Dulcet speakers on stands, cables, and power conditioning, a 20% improvement would be conservatively be equivalent to a $1000-$1200 upgrade, all for about the cost of a set of Mini-Clouds. Here are the features of the Mini-Clouds: They provide excellent vibration control performance at a very reasonable price point. In our vibration tests, the Mini-Clouds remove on average 95% of the vibration between 5 Hz and 500 Hz. This is compared to 98% for the Cloud 10, and 99% for the Cloud 11. So they go a long way in providing very effective vibration control at a reasonable price. The Mini-Clouds can be placed anywhere under the bottom of the component to balance the load. In this sense, it even offers more flexibility than the Cloud 10 (with 15 positions for the dimples) and the Cloud 11 (with 10 positions for the dimples). As it does not require the top platform, its profile is lower than that of the Cloud 10 or Cloud 11. This is especially beneficial when space is limited on the shelf. As with the Cloud 10 or Cloud 11, the ball has an optimal load of 10 lbs and has a capacity of 20 lbs. So a set of Mini-Clouds is perfect for components weighing 30-40 lbs. For heavier components, simply add more Mini-Clouds (Mini-Clouds are only available in sets of three). The bases are of double thickness with deeper wells and dimples (similar to the Cloud 11 bottom plate), thus providing a higher level of safety (the balls won't roll off of the dimples unless you deliberately push really hard).